You can use the Data Map Editor to design the conversion between the source and target schemas of a map. The Design view is used to graphically design the map by linking source elements to target elements. The left pane (input) shows the list of source elements in the source schema in tree format. This pane also shows the declared variables to be used with the conversion, and the declared external parameters. The toolbar can be used to expand and collapse the tree and view cardinalities for the source schema. 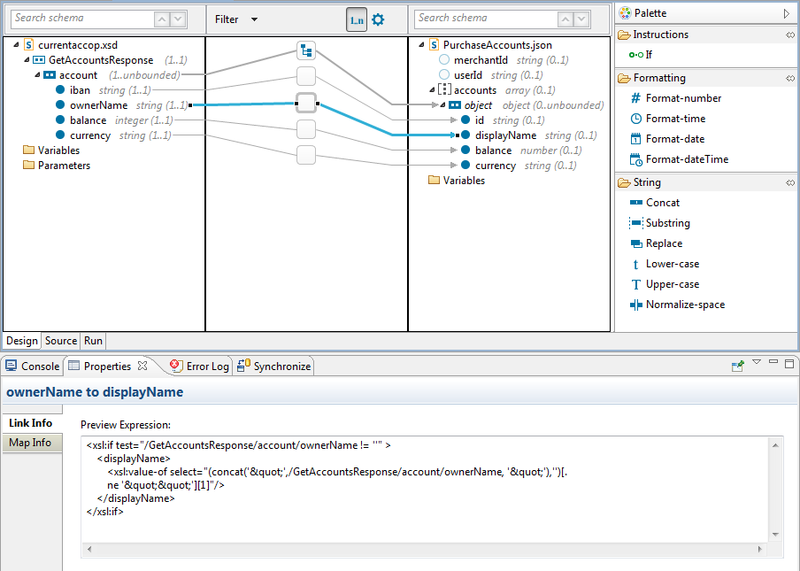 The right pane (output) shows the list of target elements in the target schema in tree format. This pane also shows the declared variables. The toolbar can be used to expand and collapse the tree and show the types and cardinalities for the target schema. The middle pane shows the links representing how the source elements are converted to the target elements. You create links by drawing lines between the source and target elements. The Properties tab, at the bottom of the window, displays information for the selected link, variable, or parameter. For more information, see Properties view. The source and target trees show the name of the schema as their first root element. The child elements can be records or leafs. There are different icons for each type of item in the tree: records, leafs, attributes, objects, and arrays. The mandatory and optional items have a different icon. You can view the generated XSLT code for a map from the Source view, and you can run a simulation to validate a created map from the Run view. For more information, see Design, source, and run views.